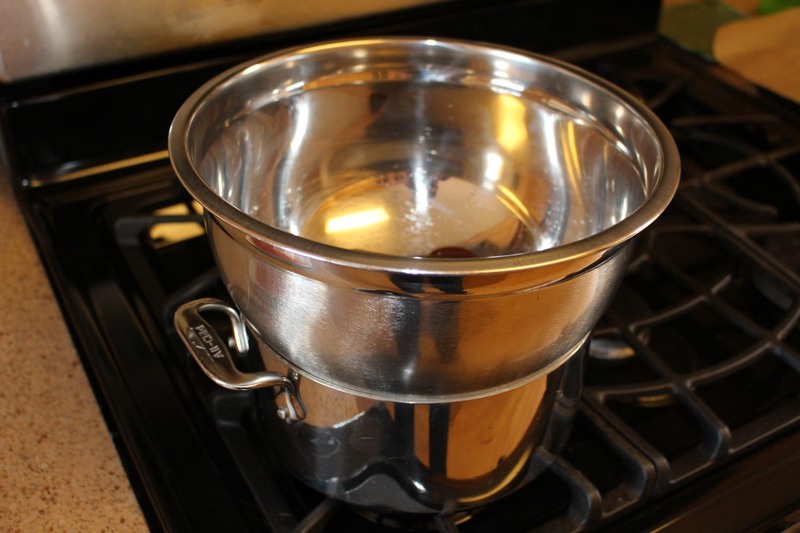 Make your own double boiler with pot and bowl. 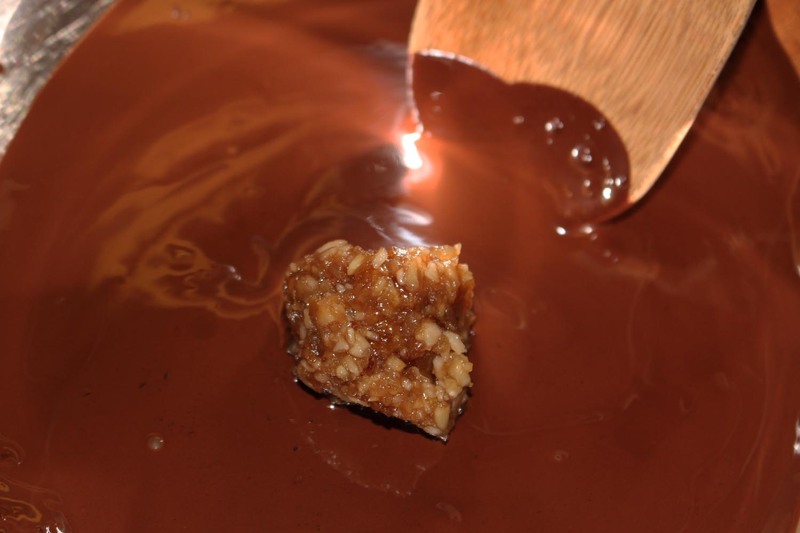 Melt chocolate in mixing bowl. Form date mixture into a ball at desired size. 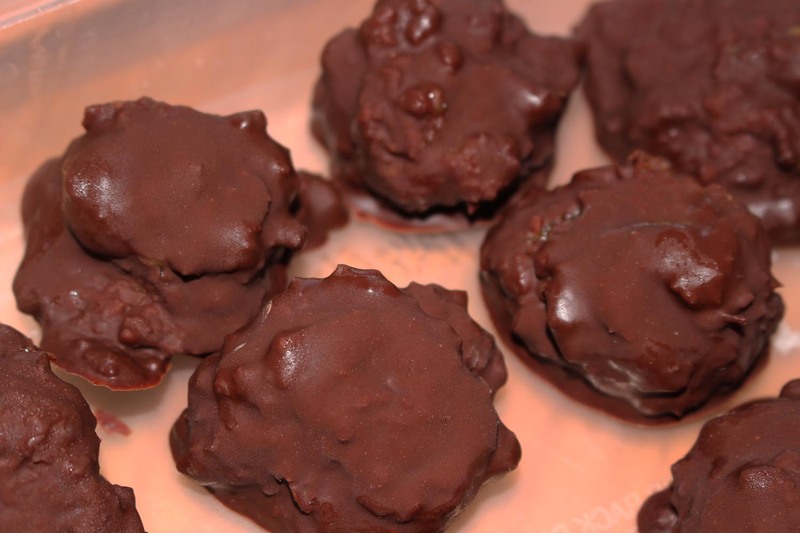 Coat balls of date mixture with melted chocolate. Covered in chocolate, ready for freezer. Frozen dark chocolate covered delights. Funny thing is I am actually a milk chocolate fan more so than dark. However, the sweet filling in these delights is enhanced by the fine dark chocolate. I liberated one of MIL’s chocolate bars for this recipe as she always has plenty of these bars on-hand. She breaks up the chocolate bars into bite sized pieces and keeps them in the freezer. She refers to them as her vitamins. Due to the cream sherry, the filling doesn’t freeze hard so they don’t have to be defrosted for serving. Makes a decadent dessert perfect for entertaining or just as a quick and easy treat. In a container soak dates in 1/2 cup sweet cream sherry for 24 hours. Pour leftover sherry from date container, into a food processor. Rough chop dates and place them in a food processor. Peel apple, core it, dice it and place in food processor with dates. Process for 1-2 minutes until finely mashed. Place in bowl and fold in nuts, brown sugar, 2 tablespoons sweet cream sherry, brown sugar, and cinnamon until well blended. In a double boiler, or if you don’t have one like me, you can use a pot with 1-quart water, and place a stainless steel mixing bowl on top. (see photo). After the chocolate melts reduce heat to simmer. 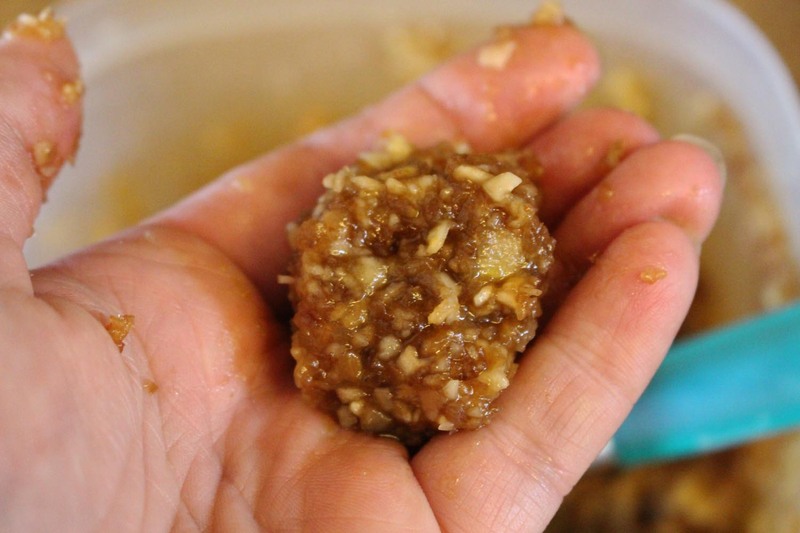 Wet your hands and form bite sized (or desired size) balls of the date mixture. (I made two sizes). 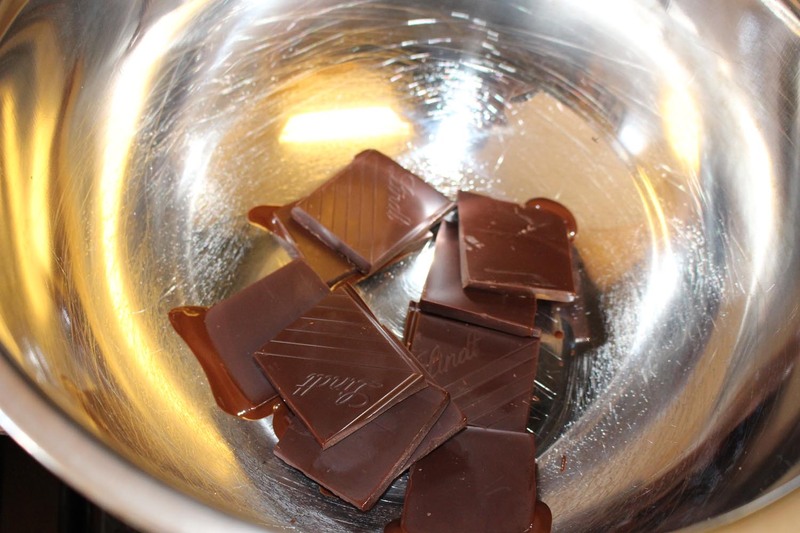 Add one at a time to the chocolate, gently covering it in chocolate. 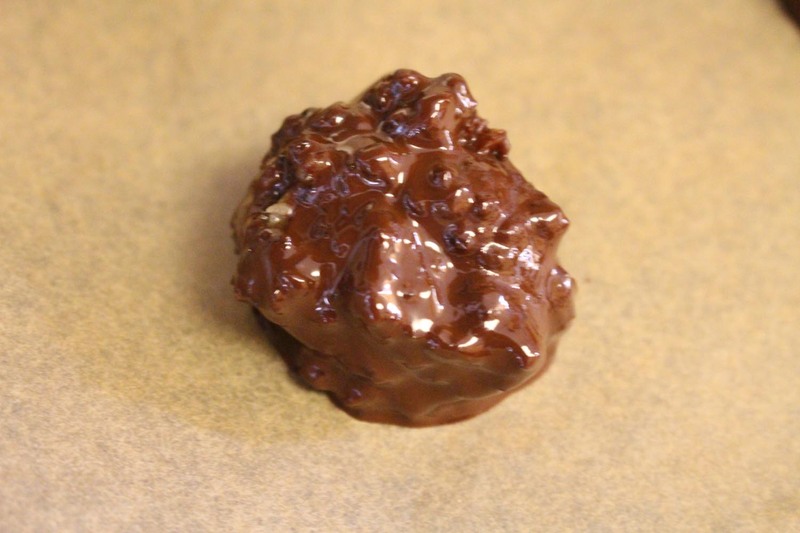 Place truffles on baker’s parchment lining a shallow pan with sides, so they are not touching. (I used a jelly roll pan). After all of the delights are coated with chocolate, place the whole pan in the freezer for 6-8 hours. Transfer them to container with a lid, (which I keep in freezer). Servings: Depends on size made. For kid version (substitute apple cider for the sweet cream sherry).